On the last day of the year, we tidied up the house, prepared our dinner, and while waiting for the food to be cooked, played with the toys from Santa. If we were in Manila, there would be a big party (I come from a big family) with abundant food and loud fireworks. Thanks to Face Time, my children were able to see how their titas and lola greeted the New Year. They oohed and ahhhed as they watched the fireworks right outside their lola’s house–16 hours ahead of our own New Year celebration. My own mom was very big on spending Christmas Eve and New Year’s Eve in our own home. She wanted all of us together as a family. Our tradition was to spend Christmas and New Year’s lunch with cousins, and aunts, and grandparents, but the Eve was reserved just for us. Aside from wearing red (lucky color), and wearing polka dots (symbol of money), putting money in pockets (to greet the year with pockets filled with money), jumping (for children to grow taller), and making noise (to ward off evil spirits), we would also turn on all the lights around the house on New Year’s Eve. On the dining table would be a huge basket of fruits to symbolize abundant blessings for the New Year. My mom would even open all the windows “to welcome the luck of the new year in”. Not too far behind her would be my older sister shutting the windows because leaving the windows and doors open meant letting the firecracker fumes in the house as well. Except for donning something with polka dots, and opening the windows and doors (it was too cold), I followed my mom’s tradition of welcoming the year. We had a quiet dinner at home with a home-cooked meal. At midnight, we clinked flute glasses filled with sparkling apple cider and Prosecco. And so, we welcome 2013 full of hope and excitement for the endless possibilities that this year may bring. Posted in Filipino Custom, Filipino Parenting and tagged family, filipino tradition, keeping culture, New Year's Eve tradition, parenting. Bookmark the permalink. Last week we trooped to watch my son’s class sing Christmas carols in the tree-lighting ceremony of the city. People at work pointed out that it was too early to light the Christmas tree. After all, it wasn’t even December yet. I don’t put out Christmas decorations early. The earliest I have bought a Christmas tree was Black Friday, and the latest was Dec 22. There were Christmases that we didn’t even have a Christmas tree. My husband felt that it was wrong to cut trees just to be decorations for the holidays. So as a sign of protest, he was adamant that we not support the Christmas tree growers–we had a potted rosemary topiary with lights instead. Then I argued that the pine trees were grown and cut precisely for the sole purpose of becoming a Christmas tree. I countered that if a tree were left in the lot, then it did not achieve its purpose in life: That tree would have died living an unfulfilled life. So the next year, I got my tree. While we decorate our house with pretty trimmings, we also prepare our minds and hearts for the birth of Jesus. On the four Sundays leading to December 25, we pray and light the candles of the Advent Wreath. During this season of Advent, I am hopeful that my children understand the difference between Christmas and Christmas symbols. With Santa Claus in the malls, advertisements for stocking stuffers everywhere, ninongs and ninangs asking them what they want, it will be challenging. My children will be supporting their school’s Toy Drive this year. They will purchase toys using the money that they earned from their car wash business. It is not a lot, but I told them that for every dollar of their own money that they use, I will match it. Because they are using the money that they worked hard to earn, they are giving up a part of themselves which I think, is the true meaning of Christmas. Posted in Filipino Parenting and tagged Advent, Advent Wreath, Christmas, Filipino Christmas, filipino family, filipino tradition, parenting. Bookmark the permalink. During my time, babies go home from the hospital with their ears already pierced. I am not sure if this was a Filipino tradition or it was just my own family’s tradition. But I know that when my sisters and I came home from the hospital, we had panahi (thread) soaked in mercurochrome already looped through the ear piercing (butas ng tenga). I remember my very first arilyos (earring). It was a turquoise blue stone that had a hinged-snap back. I wore it everyday and every night, and never took it off. They were only replaced when I outgrew them, I think, and my mom gave me something that my grandmother had given her. Well, keeping with that family tradition, I made sure that my daughter had her ears pierced as soon as it was possible. I found a pediatrician who does ear piercing (a very enterprising Filipina doctor who understood the culture and tradition). 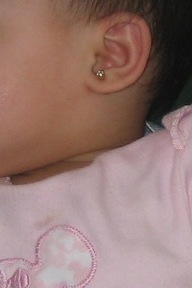 At nine months when I decided to have her ears pierced. 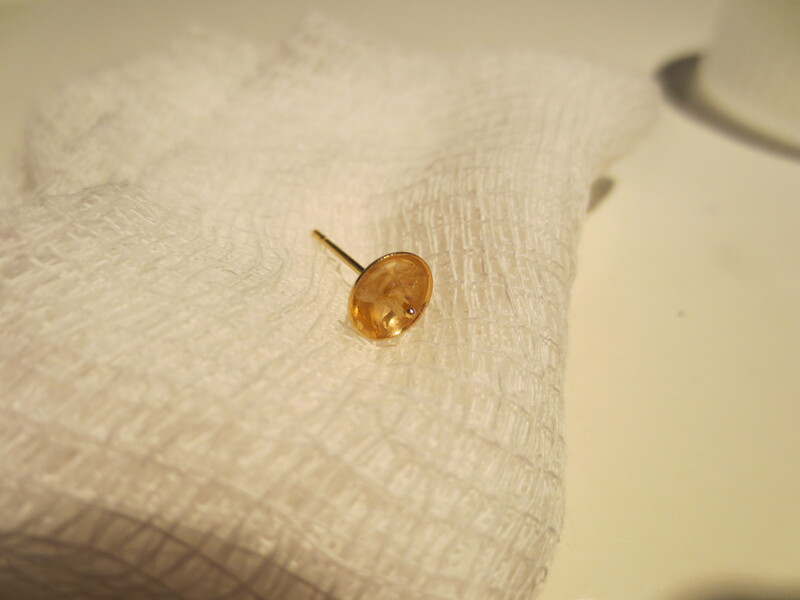 Last Thursday, we had an earring problem that ended in the injury clinic the very next day. The pearl in my daughter’s earring fell. She tried to remove the earring, but she accidentally pulled it in instead. Yiiikes! The earring got stuck in her earlobe. We tried to numb the area with ice. That didn’t work. My husband suggested that we take it off when she was asleep, that didn’t work either. So off to the doctor the next day. I couldn’t go with them, but I gave my husband instructions–crazy-only-mommy-can-think-of-instructions! Ask the doctor if he can try to twist the earring out, so there won’t be any incision. What? Can you blame me for not wanting her to have a scar in the earlobe! Make sure to put in another earring so the hole won’t close. Well, as you may have thought, none of my requests were followed. An incision was made, but at the back so the scar won’t be seen! Very smart, I thought! And the doctor said to let the ear heal and just get another ear piercing in 6 months. And we thought we could yank it out! My daughter was in good spirits all throughout. No tears, no drama. She knew that it had to be done, and she did it. I have 6 months to look for a hypo-allergenic hinged-snap back so this doesn’t happen again. Posted in Filipino Custom, Teaching Tagalog and tagged ear piercing, filipino tradition, keeping family tradition, mercurochrome, pearl earrings, stuck earrings. Bookmark the permalink.